“Run Hard. Rest Well.” is Not Nice • Run Hard. Rest Well. The whole idea, the whole premise of “Run Hard. Rest Well.” is not nice. It is not nice, it is needed. For families to be whole. For the church to be the church. If you would like to be a change agent in your church, your school, your workplace, your neighborhood, send us a note. 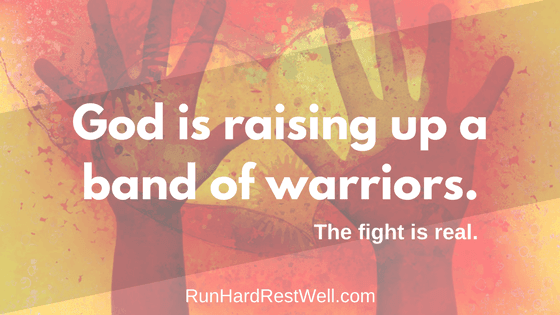 God is raising up a band of warriors. And it will be won . . . one brave heart at a time. When we turn our hearts to God’s design, overload and exhaustion won’t have the final say. We need you. We welcome you – you who are near and those who are far. We are an equal opportunity provider! If I have learned just one thing from you it is take your retreat time with God whenever and wherever it is provided. Sometimes it’s a 2:00 am when I awaken and can’t go back to sleep. Sometimes, like today, 5:30am. In this quiet time when I cannot sleep and dare not start my day, I release my cares and concerns and frustrations over to the Lord. He listens. I rarely hear answers, but I always find peace. I’m not carrying them any more. They are in His hands. He says I am to cast my cares on Him because He cares for me. I do. Then I let it go. Will it resurface? Oh, I’m sure it will, but for the time….there is precious peace. Then where do I go? Ah, within that peace my heart sings for joy and with thanksgiving for the people I love…..people the Lord lays on my heart. Oh, the joy of this time before my day begins. Is it scheduled? Not by me!!! Tomorrow will be a busy day. Today was super busy. My body is frail. Even so, my chores have been accomplished and now I am free to rest my body. How did this happen? Casting my cares. Taken the yoke the Lord shares with me. You know He is a gentle Shepherd. He carries the brunt of the load. I just walk alongside and obey His call for me. Do I believe I can do this? No way. All He asks is obey. Love you. There is nothing sweeter than his surprise invitation into the quiet. The abundance and generosity of His love washes, fills, renews.